This quality Laser Pointer is classically styled with a matte silver case and pocket clip. The light weight aluminum case is functional for everyday use. 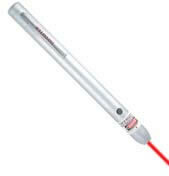 The laser projects a bright red dot that is very effective for meetings, lectures, briefings, and inspections. This pointer makes an excellent promotional gift or corporate incentive when engraved.